HP first announced that it would relaunch the WebOS as an open source platform for developers in December last year. After nearly 9 months, HP has delivered on that promise by finally announcing the very first version of the open source WebOS. The open source version of the WebOS includes 54 open source components of WebOS, along with 450,000 lines of code, and has been released under the Apache 2.0 license. 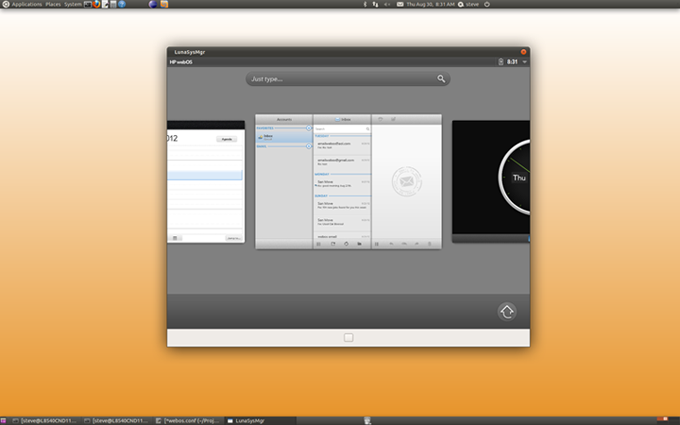 Seen above is the screenshot of the beta version running on an Ubuntu desktop. HP has released the first version of open source WebOS as two different environments. The first one is a general desktop build and the other is a more specific, OpenEmbedded build. The Desktop build, HP says, is an “ideal development environment for enhancing the webOS user experience with new features and integrating state of the art open source technologies.” Developers will able to test this version on powerful desktop machines, chiefly Ubuntu desktop, with access to a lot of resources. The Desktop build has been designed to support core applications such as Calendar and Contact, along with support for a host of third party Enyo apps. The OpenEmbedded build, on the other hand, “provides the ideal development environment for porting webOS to new and exciting devices.” This specifically means, ARM based smartphones and tablets and perhaps even static devices powered by ARM chips. Developers will be able to work with an ARM emulator, that has been provided, along with critical services such as db8 and node.js. “We are actively converging on an OE Core image which boots to System Manager and the full webOS experience.” says HP. According to HP, the OpenEmbedded build was developed because of its widespread community adoption, its ability to cross support different varieties of embedded platforms and a diverse range of hardware architecture. HP wants the developer community to come together and extend its support for the development of the open source WebOS.